Justin Hartfield plays a lot of golf, and when he does, he's almost invariably high. He's the Southern California-based CEO of Weedmaps, an outfit we described as a Yelp! for pot in our recent golf-and-marijuana feature, "Where There's Smoke." Hartfield has a state-issued medical marijuana card, so he can get stoned legally. Although smoking marijuana in public is forbidden, he says he's never been hassled about it on the course. 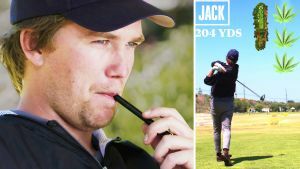 "Especially at these Southern California courses where you don't see the group in frontof you or the group behind you, a lot of guys will pull out a bong or a joint and no one is the wiser," Hartfield says. Below, Hartfield offers some thoughts on the different types of marijuana and how he likes to use them during a round. Note: If you're opposed to marijuana use or offended by people who smoke it, this would probably be a good place to stop reading. *"Around the fifth or sixth hole, I like to move to a high-THC sativa. Maybe something like a Tangie, which is a tangerine-smelling [strain], a really delicious kind of flower. Or maybe I'll move to a haze, like a Lemon Haze. **"And then maybe at the end of the round, that's where I'll switch to indica only. You want your body to relax. You don't want to have too much pressure going into the 17th and 18th holes. Maybe I'll have a dab of CBD (cannabidiol). That's the stuff that doesn't get you high, but it has a really nice body effect. If my back hurts a bit during the round, I might have a dab of the indica and then a second dab of the CBD back-to-back: one for the head and one for the *body."